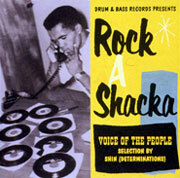 Volume 2 of an 8 CD issue Rock A Shacka series in Japan. At last we have unissued material on CD from Prince Buster. Seven tracks from Prince Buster many from the Blue Beat label including 'Rum & Coca Cola' from 1965. This track alone is worth the price of the CD. 'Blood Pressure' also issued in 1965 is a leaser know upbeat track. We also have the rare instrumental 'On Broadway' by the Skatalites giving the Ska treatment to the Drifters hit, wrongly attributed to Buster's All Stars. Two instrumental tracks by Don Drummond and the pounding Ska of 'City Riot' from Buster's All Stars. The last track is 'I Won't Let You Cry' from 1966 issued on the Blue Beat label in the UK. The sound quality is what you would expect as most tracks are dubbed from 45's. Licensed from Island records and issued on Rock A Shacka CD UPCH 1235 Japan.